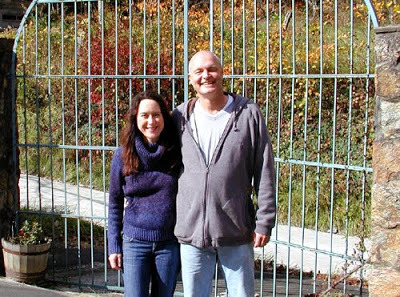 Bill and Lydia (pictured above in front of the former entrance gate to the Inn on Mill Creek property) had their elopement ceremony last weekend at the Inn and stayed with us for a few days afterward. It was just the two of them, exchanging their vows under the wedding arbor by the water. The weather was perfect and their ceremony was just beautiful. We had the privilege and honor to serve as their witnesses at this special occasion. Can’t wait to see their photos, taken by the talented Chris Chromey. Congratulations, Bill and Lydia, and best wishes!